Soul Demons live off the souls of the living. When Haydan’s home world is invaded by a soul demon seeking an item shrouded in myth and legend, his father evicts him and sends him to safety. His chosen one and warrior should provide reassurance and sanctuary, but neither appears to be working very well. Just when he thinks matters cannot get any worse his scheming grandmother arrives. She has her own plans that appear to involve him, none of which bodes well. Diego feels confident he has the soul demon under control. Overlooking his devious mother’s involvement, he fails to appreciate that he is not only storm rider elder, but also an elven prince and certain debts are about to become due. Lavinia worries about her grandson, but also who she left behind in the elven realm a long time ago. Tallin thinks she abandoned him and he is livid. She has everything under control, including Tallin…at least that is what she thinks. They all need to learn afresh who to trust. With a soul demon on the rampage, an unleashed, angry and betrayed elven king and a long-forgotten mask surfacing, what could possibly go wrong? The past is about to catch up with all of them. Nothing is going to go as planned because the mask and the gods have other ideas. What I did like in Mask of the Gods were the swirling dervishes. They are small annoying animals who first appear to just be up to mischief, but they turn out to have better intentions. I enjoyed them because at first, they showed up at what seemed to be random times, but later on, I understood that they served a fuller purpose in the story. In my head they look like small fluffy yarn balls with a face, ears, tail, and legs, and who wouldn’t like that? However, I found the writing style in Mask of the Gods to be very jumpy and sometimes quite unclear throughout the story. This made it hard for me to stay engaged from the very beginning. I was quite confused about the whole context of the story because it seemed to me that the entire story takes place in some kind of shadow world next to our own. It almost resembled the same situation with muggles and wizards (Harry Potter reference in case you aren’t familiar with the terms) where the muggles have wizards in their midst and are completely oblivious to it. 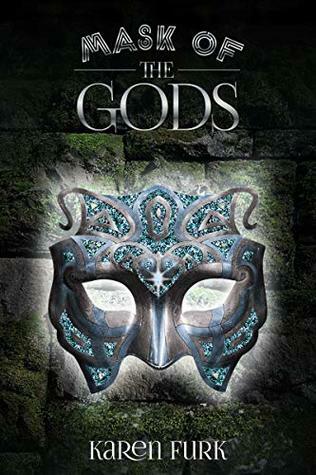 Some of the characters in Mask of the Gods are human, some are of elvish heritage, and some are storm riders, but the humans, unless included in the secrecy, doesn’t know about the elves and the storm riders. Sometimes the story spoke of actual places, like Scotland, but other times there were references to ‘earth’ and ‘a different realm’, and I noticed I wasn’t quite able to place everything together in a coherent universe. I felt that I didn’t get a quite as clear sense of the characters as I would have liked. Maybe this will become clearer at some later point in the series, we’ll just have to wait and see. Who the main characters are is quite easy to figure out if you’ve read the synopsis beforehand (note to self; get better at that before I start the book, hehe). I enjoyed Arianna’s, Haydan’s warrior, spirit, and I also very much liked Lavinia’s cunning nature which made it hard to place her and her intentions in the story. It made for some interesting plot twists along the way. I know that this doesn’t sound very positive, but this is Furk’s debut book, and the idea of the story isn’t bad, so I’m not going to denounce her yet. This is the first book in the series and maybe things will be clearer at some later point in the coming books? Or maybe the book just wasn’t suited for my imagination, that’s also quite possible. Mask of the Gods was not my kind of book, I have to admit that. I think however that people, in general, will like it due to its creativity and great aspects of fantasy. It’s really nothing normal about this book, and if you enjoy that I think it will be a much better fit for the reader. I found some positive aspects within the story, but as a total, I can’t say that this was a book I enjoyed to read. Karen Furk loves fantasy stories. She has done ever since she was a small, lonely child with an over active imagination. She’s particularly fond of stories that are crammed full of magic, mayhem and magical creatures. Karen’s background in marketing laid the foundations for her writing career which began after a serious bout of depression. No longer able to contain her over active imagination, the stories finally flowed onto a page. She aims to surprise and delight with the characters and worlds she creates. She lives in the North West of the UK with her husband, two boys and a hamster called Rufus (Yes, a girl hamster with a boy’s name. Don’t ask, she just embraces the crazy!). Visit her at karenfurk.co.uk or find her on social media and say hello – she’s on Facebook, Twitter, Instagram and Pinterest under the user name karenfurkauthor.